As the late trade deadline (April 3, 3pm) of a shortened season approaches, teams are finally starting to get a better idea of where they fit into the mold of buyers and sellers. For the Los Angeles Kings, there was never a question that they would be buyers as they try to repeat as Stanley Cup Champions for the first time since Detroit pulled off the feat in ’96-97 and ’97-98. The problem that the Kings are now facing is that one of their most valuable trade pieces is also their most valuable insurance piece as well. Welcome to the perplexing world of goaltender Jonathan Bernier. Jonathan Bernier originally requested a trade prior to last season’s trade deadline because he wanted to join a team where he could get more playing time and compete to be a starter. Last season, the Kings top goalie and eventual Conn Smythe Winner, Jonathan Quick, started in 69 regular season games (and then all 20 playoff games) while Bernier only received 13 starts. The team denied Bernier’s request at the time and he made his wishes known publicly over the summer. Lockout aside, it was a busy offseason for Bernier’s counterpart as Quick signed a lucrative 10-year contract extension and then underwent back surgery. 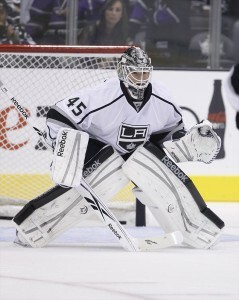 The contract all but ensured that Bernier would never get a chance to be the starter in Los Angeles. On the other hand, back surgery for Quick also meant that Bernier would be much more important to the Kings this season as insurance. As if Bernier’s trade requests, Quick’s contract status, and both of their performances weren’t enough to cloud the picture, Bernier’s contract status complicates matters even further for the Kings. He is currently making $1.25 million and will be a restricted free agent after this season. The Kings still have plenty of options, but each one has its own visible flaws at this point. As far as insurance plans go, General Manager Dean Lombardi would have the best coverage ever if he opted to keep Bernier through the rest of this season and found a way to re-sign him in the offseason. Keeping Bernier for the rest of this year makes perfect sense based on his numbers and how well he has carried the Kings when necessary. The re-signing part is very unlikely based on Bernier’s own wishes though. If the Kings could somehow find a way to persuade Bernier to remain in his backup role, it would likely cost extra money to make up for his lost potential as a starter elsewhere. Money aside, there is no guarantee Bernier would be happy with his playing time in the future either. Realistically, there is almost no chance that Bernier would want to re-sign and stay with the Kings after this season is over. Another option would be to keep Bernier through the end of this season and see if he can help Quick and the Kings win another Stanley Cup before his contract runs out. At the end of the year, Lombardi could assess the market and trade Bernier’s rights to a team looking for a starting goaltender for next season. This would be a similar path to what Nashville did with Anders Lindback last season. Lindback was a highly valued backup with solid numbers in the NHL behind Pekka Rinne. The Predators were able to get two second round picks in 2012, a third round pick in 2013, and Sebastien Caron from Tampa Bay for Kyle Wilson, a seventh round pick in 2012, and the rights to Lindback. Bernier has gained more experience and has had more success in the NHL than Lindback though. Theoretically, he should bring back more in return for the Kings. It’s not out of the question that Bernier could bring back at least a first round pick or a second round pick and a player after this season depending on the teams interested. The big downside to this option is that it may be useless for the 2013 Kings and their Stanley Cup aspirations. If Quick regains his Conn Smythe form, Bernier’s value to the team drops significantly. He has been a great asset to the team so far, but his value is quite limited on the bench and the Kings have other needs to fill for this year’s playoff run. Finally, as many rumors would suggest, the Kings could trade Bernier before the deadline and pick up a potentially vital piece for another Stanley Cup run. His value will be somewhat limited since teams know he will be a restricted free agent at the end of the season, but a bidding war could benefit the Kings very quickly. The Kings are rumored to be looking for a top 6 forward and a shutdown defenseman before the deadline. With teams such as Florida, Calgary, Toronto, and seemingly half of the NHL in search of a goalie for the future, the Kings could certainly add some useful pieces at the deadline by dangling Bernier on the market. 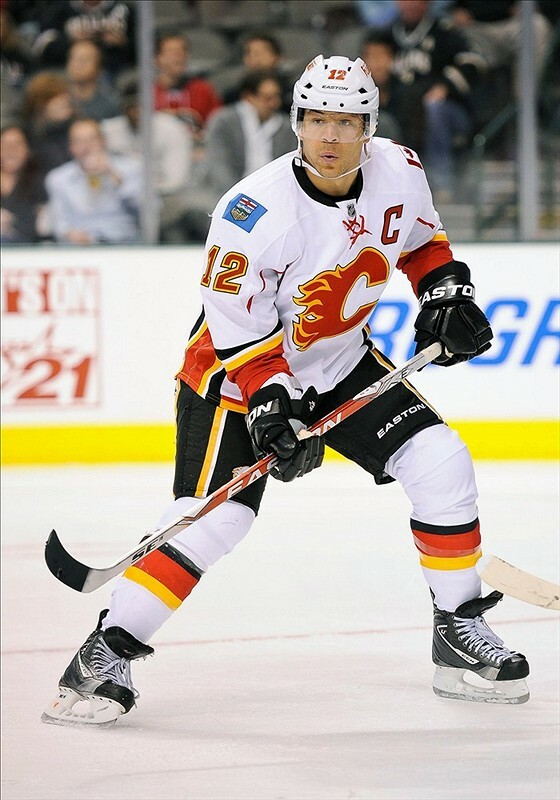 There have already been plenty of rumors linking the goalie as a piece for a deal that would bring Jarome Iginla to Los Angeles. The risk in making a move now is two-fold though. First, there is the question of whether Jonathan Quick is ready and able to handle almost every start for the rest of the season without seeing any major lapses in performance. The second problem is that the Kings do not have another goalie ready to slide into the backup role quite yet. Their top organizational candidate, Martin Jones, is playing for the AHL’s Manchester Monarchs and has a 19-21-4 record with a 2.56 GAA and .917 save percentage. Odds are, the Kings would want a backup goalie in return or would need to find a veteran backup elsewhere for the rest of the season. Despite the risks, it’s time to trade Jonathan Bernier. As the past two games have demonstrated, the best goaltending in the world won’t matter if the Kings can’t score. Alternatively, the addition of a defenseman would surely help Quick in net as well. The time is now for the Kings, and management needs to put the best roster possible out on the ice. With Bernier on the bench, there is value and potential going to waste on the current team. It’s time to transform that value into something that can contribute in every game heading down the stretch and into the playoffs. When all is said and done, things will have already gone awry for the Kings if they are depending on their backup goalie anyways.